Maintaining your commercial electric motors when needed ensures maximum safety, efficiency and productivity for your business. Not sure if you need to maintain, repair or replace your pumps, hoists or other commercial or industrial electric motors? Make sure to call qualified electric motor repair experts if you suspect a malfunctioning motor, to avoid electrical injuries and to ensure that you do not permanently disable the motor. Fortunately, regular maintenance and preventative care will often prevent surprise work stoppages, as well as improving the overall longevity of your electric motor. An old motor that is properly maintained and repaired could hypothetically last forever, however, this may not be the most cost effective option for your business. Aging motors often do not run as efficiently as they did when they were new, and often replacing an old unit for a quality new one can be more budget-friendly in the long run because of the productivity saved. Technological developments in newer motors results in a significant conservation of energy, just as the motors in newer household appliances such as furnaces and air conditioners help lower energy bills. Many software and spreadsheet tools exist to aid in your decision by measuring the energy consumption of either repairing or replacing a motor. The availability of a spare motor should also be taken into consideration. Repair may be a necessary alternative if the replacement motor must be specially ordered, and may take weeks or months to acquire. The decision to repair or replace varies with individual needs— whether a short-term solution is preferable, or a long term investment. Either alternative successfully cuts costs if done by skilled motor experts. 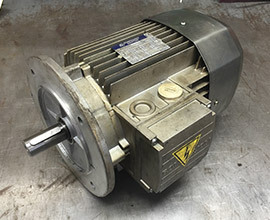 If the motor is suitable for the application it was being used for, or if there is a more practical model for the job. Does the federal regulation for energy-efficiency, EPAct, cover that particular model? If a catastrophic failure has occurred — causing significant damage to the motor — this could indicatethat the motor exceeded its rated temperature rise, rotor parts melted or broke, or serious damage occurred to the shaft, frame or other mechanical parts. Repairing a rotor or buying a new shaft or frame may not be feasible or financially practical, unless the motor is very large or specially equipped. Sometimes evidence of a catastrophic failure only reveals itself after disassembly and inspection of components by a professional. These aspects can be tested and evaluated by electric motor repair experts to help you determine the best course of action for your specific needs. For more information on electric motor repair or replacement from the experts at Fixall Electric Motor Service, please contact us here or call us directly at 616.454.6863.